She always tried to dress down on her first date with a man. Many employees dress down on Fridays. 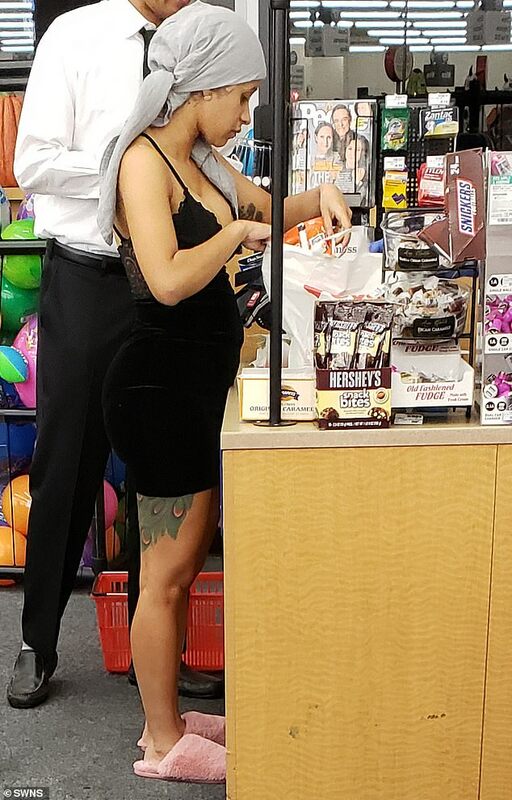 New mom Cardi B took a midnight trip to a Hollywood pharmacy clad in a slinky negligee and pink fluffy slippers. The rapper hit up the CVS at the intersection of Beverly Boulevard and La Cienega Boulevard after midnight to nab a charger for her iPhone. The 26-year-old star appeared to have come straight from bed, as she donned a slinky velvet chemise and slippers and had hair wrap which held back her locks. Cardi, who welcomed her daughter Kulture Kiari in July, browsed the store’s makeup aisle, picking up an anti-aging cream, according to a source. A strange figure appeared in the doorway, clad in white. Someone nabbed my apple when I wasn’t looking! The police nabbed the thief. The star was accompanied by her driver during her early morning shop on October 7, according to student Jeidi Diakite, 38, who snapped the images of Cardi. Jeidi said: ‘She went to the makeup aisle and picked up some anti-aging cream and makeup remover. ‘She seemed to come in to buy a charger for her phone and asked her driver to go and get it. ‘She went and was browsing the perfume section and then went to stand in line at the checkout. ‘She was kind of scratching her head under her hair wrap. I don’t know maybe she has dandruff or something. They stood in line for several hours for tickets. Dozens of people were queueing(lining) up to get tickets. We had to queue for three hours to get in. Your fruit and vegetables will be weighed at the checkout. She works on the checkout at the local supermarket. Jeidi, who lives in West Covina, Los Angeles, said Cardi seemed to be extremely humble and was kind to the staff that rang up her items. ‘She seemed really humble and quiet. She seemed like a pleasant person and was really respectful to the staff. After shopping for 20 minutes, Cardi left the store in an SUV which was waiting for her outside. She rang up our purchases quickly and we left. I’m sorry, I rang up the wrong amount.